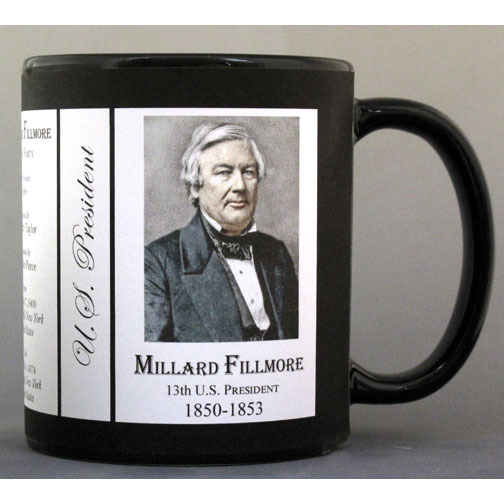 This U.S. President Millard Fillmore History Mug is one of a complete collection of U.S. Presidential biographical mugs. 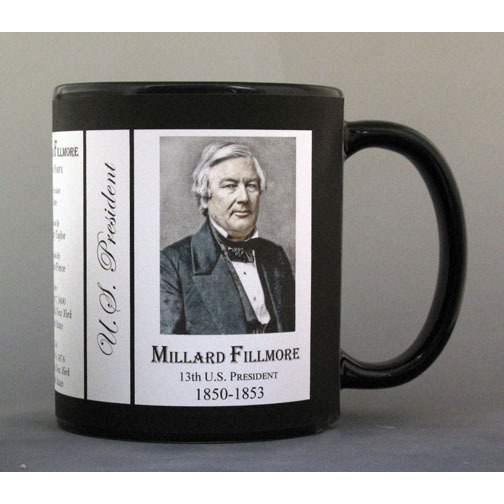 An image of Millard Fillmore and a short biography are features of this history mug. U.S. President Millard Fillmore was a New York lawyer who was elected to the U.S. House of Representatives. He was the last Whig president. As Zachary Taylor’s vice president, he assumed office after Taylor’s death. An anti-slavery moderate, he supported the compromise of 1850. Fillmore was passed over by his own party when seeking reelection in 1852. When the Whig Party disbanded a few years later, Millard Fillmore joined the American Party, which was the political wing of the anti-Catholic, anti-immigrant “Know-Nothing” movement. In 1856, he ran for president on the American Party ticket but finished last. He denounced secession but was critical of President Lincoln’s policies. There are three separate branches of government in the United States; the legislative, executive and the judicial. The president is the head of the executive branch, the elected head of state and the commander-in-chief of the U.S. Armed Forces. The executive branch is responsible for executing and enforcing federal law, appointing heads of all executive agencies and federal commissions. The president is responsible for promoting diplomacy with other nations, issuing executive orders, signing pardons and international treaties. When legislation is passed in Congress, the president has the power to sign or veto bills. The Constitution states that the president must be a natural born citizen of the U.S., at least 35 years old, and have lived in the U.S. for at least 14 years. Elections are held every four years and the president is limited to two, four-year terms. 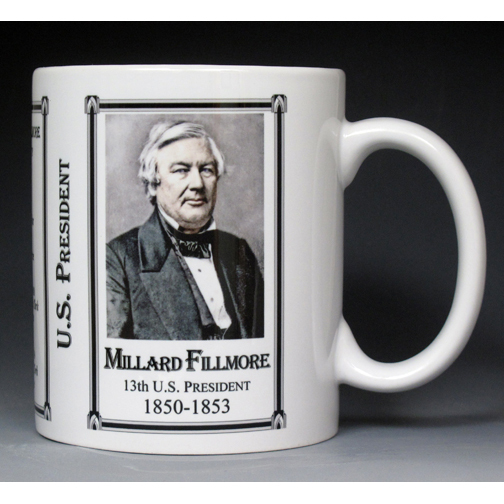 The Millard Fillmore biographical history mug is part of our Presidential series. The biographical History Mugs were created to teach and inspire individuals to learn about our diverse and interesting history. The biographies were researched and written by history enthusiast, Robert Compton. He colorized most of the historic photos and images used on the mugs, which were originally black and white or sepia tone. The images and biographies are imprinted on mugs at his studio in rural Vermont. Mugs are food and microwave safe. To preserve photographic quality we recommend hand washing. Mugs are usually shipped within 3-5 days. Shipping charges are lower when buying multiple mugs. 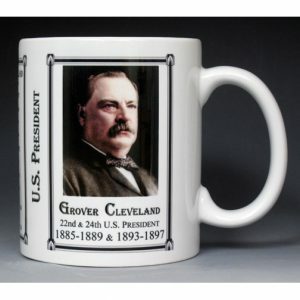 This U.S. President Grover Cleveland History Mug is one of a complete collection of U.S. Presidential biographical mugs. 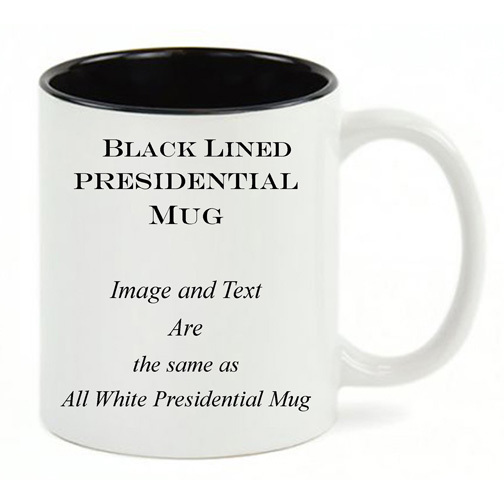 An image of Grover Cleveland and a short biography are features of this history mug. 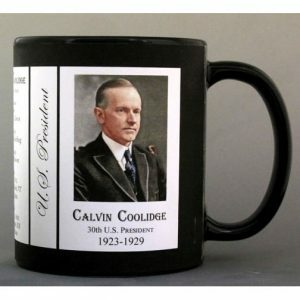 This U.S. President Calvin Coolidge History Mug is one of a complete collection of U.S. Presidential biographical mugs. An image of Calvin Coolidge and a short biography are features of this history mug. This U.S. President Rutherford B. Hayes History Mug is one of a complete collection of U.S. Presidential biographical mugs. 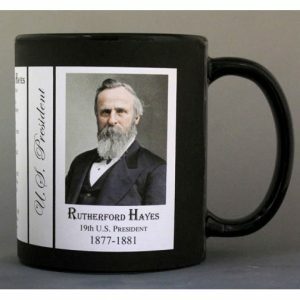 An image of Rutherford B. Hayes and a short biography are features of this history mug. This U.S. President Chester A. Arthur History Mug is one of a complete collection of U.S. Presidential biographical mugs. 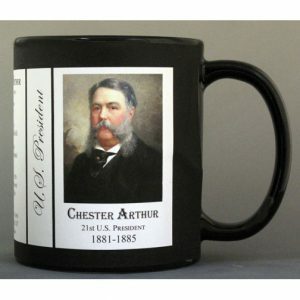 An image of Chester A. Arthur and a short biography are features of this history mug. This U.S. President Theodore Roosevelt History Mug is one of a complete collection of U.S. Presidential biographical mugs. 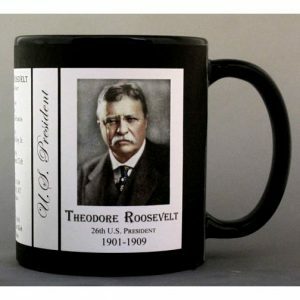 An image of Theodore Roosevelt and a short biography are features of this history mug. This U.S. President James K. Polk History Mug is one of a complete collection of U.S. Presidential biographical mugs. 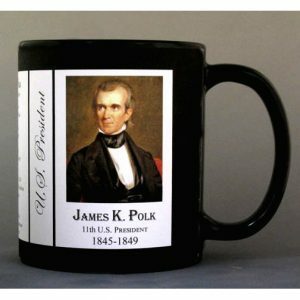 An image of James K. Polk and a short biography are features of this history mug. This U.S. President Benjamin Harrison History Mug is one of a complete collection of U.S. Presidential biographical mugs. 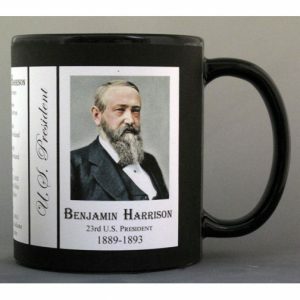 An image of Benjamin Harrison and a short biography are features of this history mug. This U.S. President Zachary Taylor History Mug is one of a complete collection of U.S. Presidential biographical mugs. 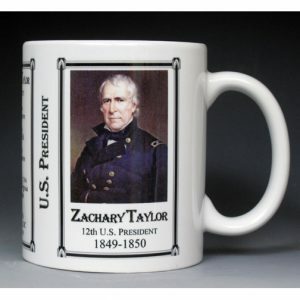 An image of Zachary Taylor and a short biography are features of this history mug.